Week 3 forecasts to be a typical September week where low-60s passes for cold weather. The Raiders and Dolphins play the only open-air game with even an expected drizzle, and so home versus road and indoors versus outdoors carry my fantasy football venue and weather adjustments this week. Elite subscribers can peruse the full list of those adjustments, and despite the lack of weather concerns, there are several that I think merit some special attention. Kirk Cousins’ (+1.2) home/road splits are out of whack so far in 2018 because he threw the ball 48 times in his overtime shootout in Green Bay last week. Overall trends suggest he’ll be better at home, where he plays this week. He averaged a bit more than two extra fantasy points per game at home versus on the road between 2015 and 2017 when he was in Washington, and now he has a dome. It would be enough to jump Cousins into my top-10 among quarterbacks, but he falls back out because of the Bills matchup. Expect the Vikings to build a big lead and then rely on their running backs to kill clock. That tendency has led the Bills to allow 35 percent fewer passing touchdowns and 35 more rushing touchdowns than a typical team. Latavius Murray (+0.3) could be a sneaky play in deeper formats as the team’s primary goal-line back. I have him 38th at the position in PPR formats. Dalvin Cook (0.0) doesn’t enjoy the same venue bump, but he’s 10th in my rankings anyway. Start him if he’s healthy enough to play. Deshaun Watson (+1.3) has been unable to pick up where he left off in his injury-shortened scorcher of a 2017 fantasy season. An overdue return to Houston for the Texan’s home opener against the Giants this week should cure what ails him. In addition to the 1.3-PPR point fantasy boost Watson should see at home in the dome, he’ll enjoy a defense that has allowed 50 percent more passing touchdowns per attempt than an average team, the highest rate in football. Watson is my No. 1 quarterback this week, and DeAndre Hopkins (+0.6) and Will Fuller (+0.5) are my Nos. 2 and 20 receivers, respectively. Get them in your lineups. On the other sideline, Eli Manning (-1.8) has some of the biggest home/road splits in football. You probably weren’t starting him anyway. 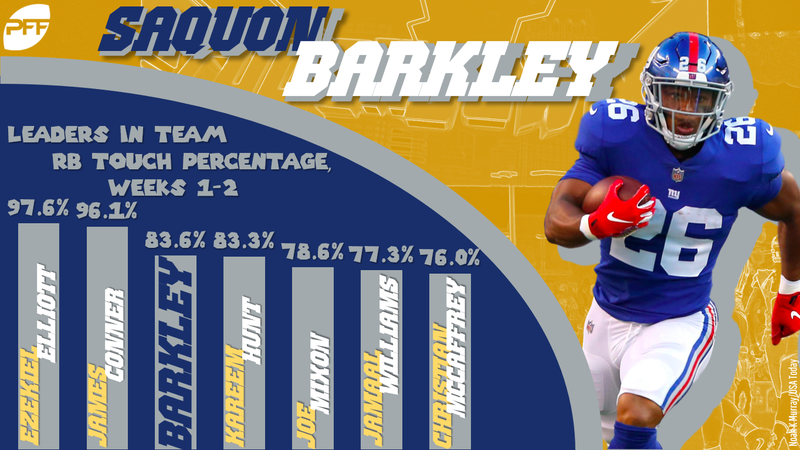 You are starting Saquon Barkley (-1.2), regardless of the situation. I just wanted to take this opportunity to mention that Barkley is my No. 6 running back in a bad matchup. Only Ezekiel Elliott and James Conner have taken bigger percentages of their teams’ running back touches over the first two weeks. Barkley is in the mix to be the best player in fantasy this season. The four interceptions Matthew Stafford (+1.3) threw in his Monday night opener will likely color the public perception of him this season, but my projection and ranking process continues to love him, especially when he’s at home. He has 99 pass attempts on the year, two fewer than Ben Roethlisberger in the top spot and 10 ahead of the rest of the field. He also may have the best group of receivers in football. Marvin Jones (+0.6), Golden Tate (+0.6), and Kenny Golladay (+0.6) should all benefit from the plus matchup this week. In particular, I’ll mention that Golladay has 20 targets this season, which is tied for the 12th-most at the position. He joins Jones in my top-10 this week. Coming off back-to-back games with 400 yards and 4 touchdowns and facing a Steelers defense that allowed 6 touchdowns to Patrick Mahomes on Sunday and has allowed more passing yards and touchdowns per attempt than a typical team in general, Ryan Fitzpatrick (+0.7) may deserve better than my No. 12 ranking this week. Part of that reticence is that I see Peyton Barber (+0.7) as having a plus matchup, too. An unusually difficult set of carries has sabotaged his 2.6 yards per carry this season. Yards Added views him as a neutral performer so far. This could be a breakout fantasy week for him. It’s only Week 3, but I’m already getting a little bored of reminding you how massive Ben Roethlisberger’s (-3.8) home/road splits are. But they are. He’s my No. 19 quarterback this week on the road. Fortunately, Antonio Brown (-2.5) and JuJu Smith-Schuster (-1.9) see such heavy target volumes that they can overcome 2- to 3-point losses of projected fantasy points and remain attractive fantasy options. They are my Nos. 1 and 13 fantasy receivers this week.